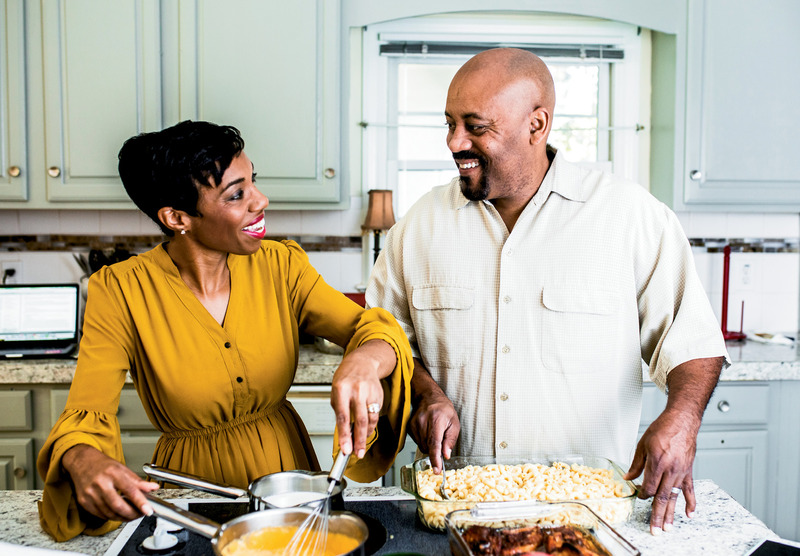 Monique and Chevalo Wilsondebriano met in New York, but they’ve found a home—and a burger following—in the Charleston community. 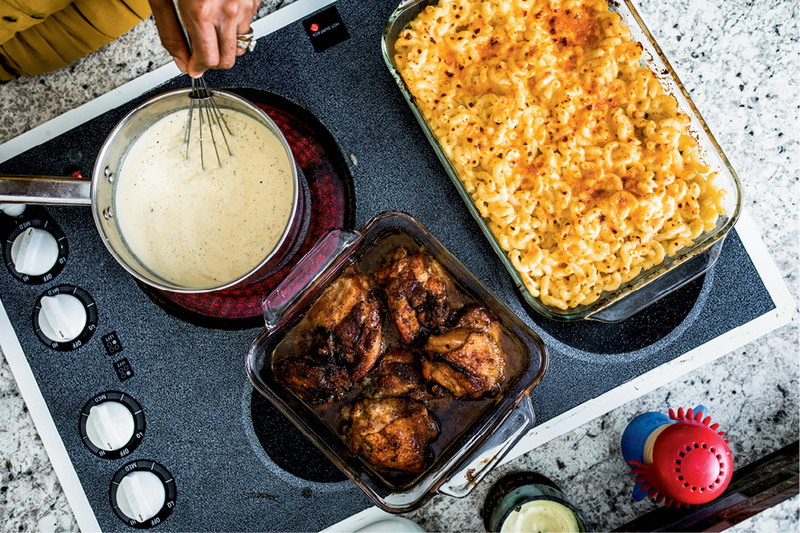 While the Wilsondebrianos are famous for their outdoor cookouts, they head inside for weeknights, making simple honey-glazed chicken and three-cheese mac-n-cheese. 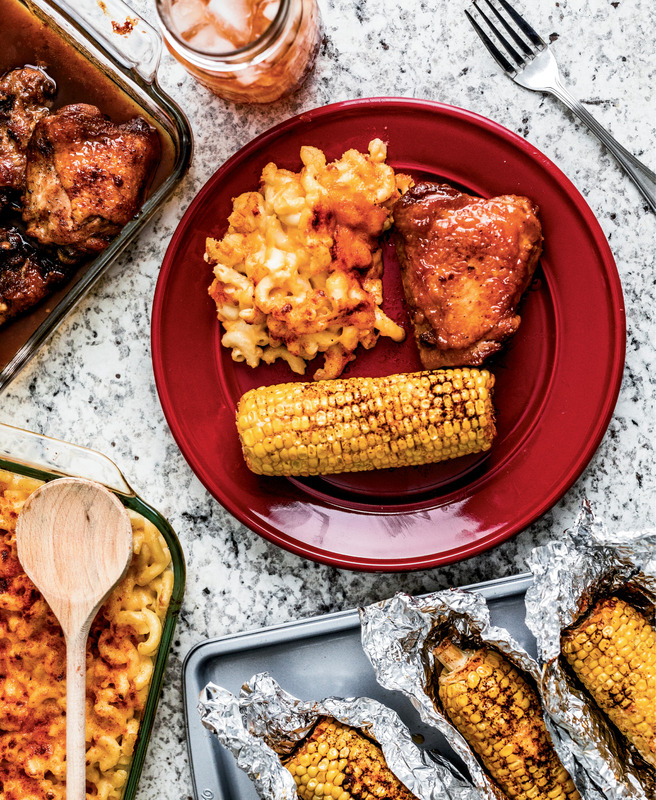 Sweet honey-glazed chicken gets kicked up a notch with sides of paprika-seasoned mac-n-cheese and corn on the cob. 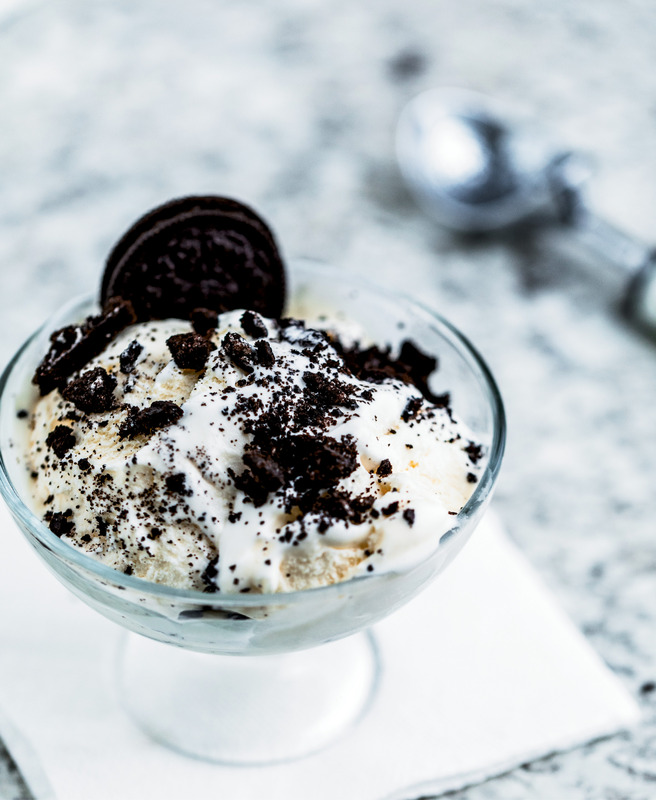 Chillin’ Out - Cookies-and-cream ice cream is a hot-weather favorite for the owners of Charleston Gourmet Burger Company and their children. The couple gets creative with mac-n-cheese by using a variety of cheeses and spices, tossing Monterey Jack, Gouda, and cheddar into the mix and sprinkling paprika on top. Charcoal briquettes glow red. Picnic tables host heated board-game competitions of Taboo and Sorry, while lively reggae music lightens the mood. It’s a typical summer afternoon at the Wilsondebriano house, where friends and family regularly turn out for backyard parties hosted by the couple behind the Charleston Gourmet Burger Company, a five-year-old business purveying tasty burger marinades and patties. “Growing up, my family had barbecues in my grandparents’ backyard,” remembers Monique Wilsondebriano, whose entrepreneurial spirit—and fondness for cookouts—is key to her company’s success. “My grandfather was a chef, and he roasted whole hogs. Everything went on the grill.” The New Jersey native now carries on the alfresco tradition with her husband, Chevalo, who grew up on Long Island, as they often toss whatever they’re cooking—from corn to burgers—over the coals. It was at one such outdoor event seven years ago that the pair cooked up the idea for their zesty sauces. After chowing down on patty after patty, friends and family told the couple, “Those burgers are so good you should sell them!” Their secret? Infusing the meat with sauce and spice. So they spread the burger joy by bottling up their secret marinades, which now line the shelves of thousands of grocery stores, home improvement shops, and big-box retailers. This spring, the company introduced a new frozen marinated cheeseburger on the QVC shopping channel. Though the heat is certainly turned up on their business, the Wilsondebrianos make an effort to be present at home with their four kids, Amber (11), Ashley (12), Shannon (22), and Brianna (23). Taking a break from the grill, the couple prepares weeknight dinners inside for ease, not to mention relief from the soaring temps. “I like being able to cook everything in one pan,” Monique says, demonstrating her handiwork with a skillet of glazed chicken. By searing bone-in, skin-on thighs on the stove top and then reducing honey and soy sauce directly in the frying pan, she creates a slightly crispy and saucy main course that her children devour. “We never have leftovers,” she laughs. The accompanying three-cheese macaroni, featuring a bitey Gouda, Jack, and extra-sharp cheddar trio, also delivers big flavor with little effort. “My youngest daughter can make this recipe on her own,” says Monique. “You just have to remember to keep stirring, so the cheese doesn’t scorch.” She suggests experimenting with a variety of cheese combinations and seasonings. “I like to use smoked paprika for a little kick.” The warm spice is also a favorite sprinkled over roasted corn on the cob along with chili powder and Parmesan cheese. 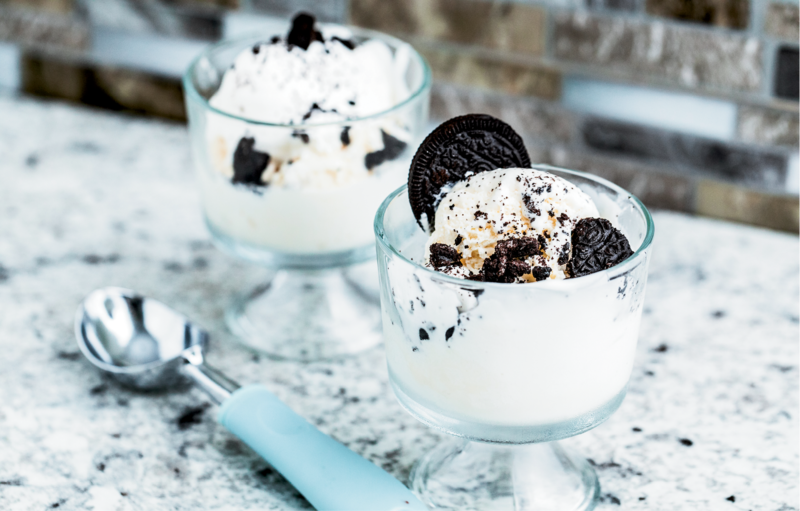 As a cool finish, the family frequently makes their own ice cream, playing with add-ins such as strawberries, brownie chunks, and crowd-pleasing Oreo cookies for a range of tastes. It seems no matter the medium, these master entertainers are keen on firing up the flavor. 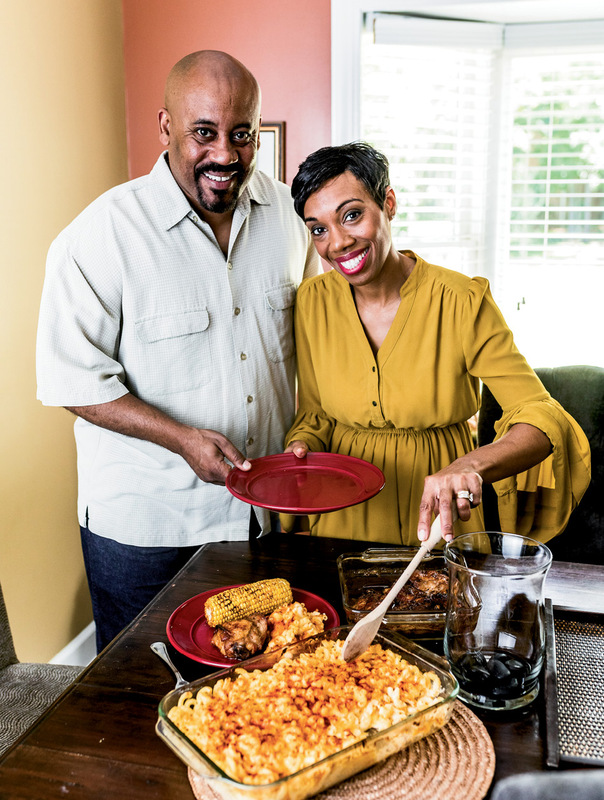 Caribbean Kitchen: “Chevalo’s family is from Panama, which means we prepare a lot of Caribbean food like jerk chicken and oxtail,” shares Monique.